It is the purpose of the Griggs County Library to provide library service on a fair and equitable basis to all individuals and groups in the supporting area. Through the facilities of the library located in Cooperstown, all of the services are provided for adults and children of Griggs County plus any contractual agreements in which the library may be involved. Bookmobile service to various outlying towns also aids in fulfilling this responsibility. The library recognizes that its major concern is the development of a media collection to benefit and enhance each person using the library. It accomplishes this by selecting, collecting, organizing, and disseminating media for the enlightenment and enjoyment of its community. Attempts to establish library service in Cooperstown began almost as soon as the town was founded. Collections were located in many early homes with reading rooms established for a period of time. Later the State Library Commission sent out Traveling Library collections to be circulated. In 1926, the Congregational Church had such a collection. For a time, the Evangelical Lutheran Church maintained a small lending library. This was a permanent collection and most of the books were donated. Continuous public library service in Cooperstown dates back to 1944. A group of interested women, recognizing the need of a permanent service, invited delegates from religious, civic, and fraternal organizations in the city to meet at the Windsor Hotel February 5, 1944 for the purpose of forming a library. Mrs. M.D. Westley was elected chairman. The first librarian was Mrs. Selmer Larson with the library being housed in the Central Light building. As the library grew, it needed more money for its operation. In 1964, the library board requested and was granted an operating mill levy from the city. At that time, other changes were made to bring the library into conformity with state laws. A small grant was received from the State Library Commission to bring the collection up to standards. In July 1968, application was made for funds to the State Library Commission, and in August was approved. A total of $13,600 was received from the State with an additional $10,000 in local funds and a building was purchased. The week of October 18, 1968, the library moved to its present location. The multi-county demonstration library was begun in 1969 and continued until 1971. In July 1971, the Griggs County Commissioners levied a tax of one mill for county library support. The new county library was known as the Prairie Bookmobile Library. 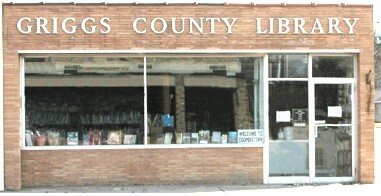 The two libraries operated separately until the spring of 1975 when they combined to form the Griggs County Library. In 1992 the residents the City of Cooperstown and Griggs County approved a mill levy increase so the library is now funded by a four-mill levy from both the City of Cooperstown and Griggs County. In 1998, circulation and processing of materials become computerized allowing the library to enter the technology age with the user-friendly system Winnebago. In 1999 a computer was added that allows patrons access to the Internet, word processing and other computer programs. During 2003 two more patron computers were added. The library launched a website allowing patrons to search for material from their home in 2005. In 2009 the circulation software was upgrade to Atriuum by Book Systems. This software allowed patrons direct access to their account from any computer. In 2001 the old bookmobile was replaced with a newer used bookmobile from Bismarck Public Library. The bookmobile continued to serve the smaller communities of Griggs County and the schools until 2010. At that time the operating costs became to great for the number of people using the bookmobile. Service continues to be supplied to the schools, home-bound patrons, and senior living centers in the county. In 2015 the library board voted to renovate the present building by improving the exterior wall insulation, laying new carpet, painting, redesigning the back room of the library to make a meeting room for public use, and adding new furnishing and furniture. This project was funded with grants, gifts, an estate gift, and building funds raised in past years. The project will be completed in 2017. Individual policies may be found under the other links.